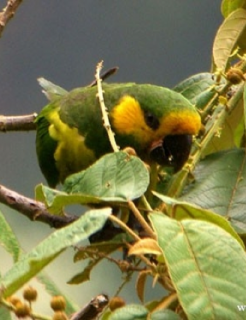 The Yellow-eared Parrot (Ognorhynchus icterotis) has been impacted by loss of habitat. It has lost over 90% of its habitat in Colombia alone. Outcomes: The World Parrot Trust, in conjunction with ABC, supported fieldwork for the Yellow-eared Parrot from June 1998 to September 1999. The aim of the project was to determine the species’ ecological requirements, distribution and status in the wild. In the 1990s, the World Parrot Trust, The American Bird Conservancy, The World Land Trust, World Land Trust-USA and others funded Proyecto Ognorhynchus, of ProAves Colombia. These funds have aided critical fieldwork by Bernabe Lopez-Lanus and Paul Salaman, have purchased crucial habitat in Ecuador, and have helped in the education and involvement of local people in the preservation of the Yellow-eared Parrot. Where found: Yellow-eared Parrots are found in the Andean highlands in NW Ecuador, north from Pichincha and W Cotopaxi, and W Colombia, north to Antioquia and NW Norte de Santander. Recently found only from degraded localities in Cordillera Central, Colombia, and W Cotopaxi, Ecuador. History: The Yellow-eared Parrot was once found in all three Andean ranges of Colombia, from Norte de Santander and Antioquia to Nariño and in NW Ecuador, south to Cotopaxi. It is still seen in the C Andes of Colombia (Krabbe 1998, López-Lanús et al. 1998, Salaman et al. 1999a). Surveys in 2008 in Ecuador in the Imbabura and Carchi failed to find birds (Anon. 2010). When re-discovered in Colombia in 1999 there were only about 81 birds, but intensive conservation actions have helped the population recover, and as of 2009 was recorded at over 1100, with three breeding populations on the slopes of the Western, Central and Eastern Cordillera. The species’ specialized breeding requirements and fragmented habitat will continue to limit its recovery (Fundación ProAves in litt. 2010). Ecology: The Yellow-eared Parrot prefers areas with Ceroxylon wax palm trees in upland humid mountain forest and will tolerate only partially cleared areas, so important is the wax palm in its overall ecology. They reportedly feed on Ceroxylon quindiuense and C. alpinum, and possibly fruit from other species in this genus, and fruits of Sanurania and Sapium spp. These birds are active at dawn feeding in small flocks, or in the breeding season, in pairs. Larger numbers are found when the birds return to roost in mid-afternoon.